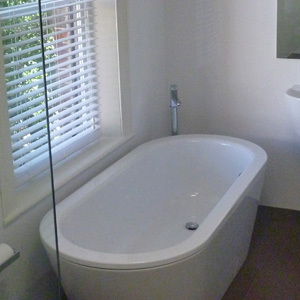 One major focal point for your bathroom is the bathtub. For this reason, you should choose it carefully to ensure that it addresses your needs in an attractive, adequate fashion. You need to learn about the various types of tubs that are on the market today. In addition, they come in different kinds of materials. We offer you the following list of bathtub facts to facilitate your decision-making process. • Standard ones attach to the walls on each end and on one side. Only the front side is decorative. These are adaptable to the addition of a shower when desirable, and the tapware is mountable on the tub or wall depending upon their style. • Whirlpool tubs are deeper than standard models are and come with jets that propel the water around your body to soothe and loosen tense, aching muscles. • Drop-in models are similar to standard ones except they are only a shell without a decorative front side. Installers insert them into an enclosure that matches your bathroom tile or cabinetry. Undermount versions of the drop-ins also are available, but these install into the floor. • Freestanding models do not attach to any other surfaces but stand on their own. Certain models come with legs of various designs while other sit flat on the floor. • Walk-in models are available for those with disabilities and come in various dimensions. Another consideration in the purchase of your bathtub is what type of material best fits your needs. While acrylic is lightweight and retains heat well, tubs of this material cost more and they may scratch. Enameled cast iron tubs on the other hand, require extra structural reinforcement to support their additional weight, but are highly durable and long lasting. These are just two examples of the available materials for bathtubs. You also will need to select the shape of your bathtub. The choices for this include round, rectangular, oblong, triangular, and other shapes. Measure the space accurately to ensure that your model will fit in the proper manner. If you need additional bathtub facts, contact Concept Bathrooms & Construction. We provide expert guidance and services in bathroom renovation and construction, including which bathtub that is ideal for your specific situation. All of our services are backed with a guarantee.